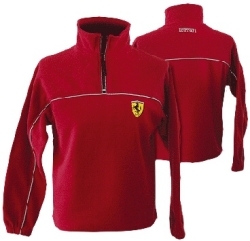 Ferrari Classic Fleece with Reflective Trim. This quarter zip fleece is made from 100% polyester. Features 3M Scotchlite™ Reflective Material piping, embroidered Scuderia Ferrari shield logo on the left chest and the small 'Ferrari' script logo on the back.